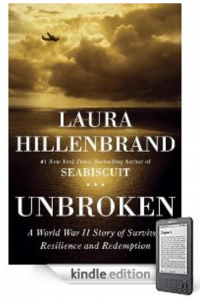 Unbroken, by Laura Hillenbrand is an amazing book. It has been in the Kindle Bestseller list for awhile and is definitely worth the top rankings. Hillenbrand is the author of Seabiscuit, another bestseller that was made into a movie not too long ago. Unbroken follows the life of famous 1930’s track star Louie Zamperini. He ran in the Berlin Olympics, where he shook Hitler’s hand. That gave me chills. Later, he joined the United States Air Force on the Pacific theater, and fought against Japan. Hillenbrand was able to talk with Louie himself, as well as many of the other characters in her book. So the accounts of the the events that occurred are almost first hand. Louie’s ability to survive the brutality that was forced upon him is just…unreal. He not only survives several months out on the ocean surrounded by sharks, but also survives brutal beatings from Japanese guards. The amusing part was, that many of the guards in the internment camps had nicknames that you can’t help but laugh about. I guess humor is the only relief in situations like the ones Louie and his fellow soldiers went through. I will say, after reading Unbroken in hardback form, getting it on the Kindle is a much smarter choice. This book is heavy! But, it is well worth it, and you certainly won’t be disappointed. I’m the one who always has a book or Kindle in hand. I always devoured books and enjoy escaping into an different world. My brother was the opposite. It was like pulling teeth to get him to read. But, even nonreaders can find their niche. My brother did with Kurt Vonnegut. The author’s books can be described as absurd and certainly didn’t fit into the mainstream. Vonnegut’s most famous work is Slaughterhouse Five, a harrowing account of his experiences as a prisoner in Germany and the bombing of Dresden. Slaughterhouse Five tells the story of Billy Pilgrim, a prisoner in Slaughterhouse Five in Germany during World War II, just as Vonnegut was. The twist, however, is that Pilgrim was abducted by aliens and time traveled. He went off to different areas of time and comes back the present, where he is prisoner. In a sense, this what prisoners had to do with their minds to remain sane. I’ve read books where the prisoners would imagine that they are eating their mother’s cooking, or done something they loved to escape the misery. 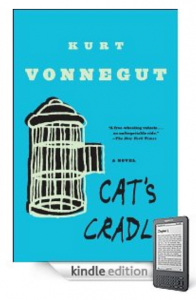 I am currently reading Vonnegut’s Cat’s Cradle on my Kindle, and I have to admit it veers away from my typical reading material. But, so far I find it pretty funny. The narrator, Jonah, sets off to find out more about the atomic bomb that was dropped on Japan to end World War II. Throughout his journey to learn more about the bomb and the person who invented it, the reader encounters some major themes dealing with science, religion and politics. Cat’s Cradle manages to provide great insight on these hot topics while integrating quite a bit of dry humor. It is fitting that I am reading about the atomic bomb, because I also just finished Laura Hillenbrand’s bestselling novel, Unbroken, which chronicles the life and experiences of an American POW in Japan. That one is particularly riveting and I highly recommend reading it. Vonnegut also wrote many other books, including Breakfast of Champions that are certainly worth checking out. However, not all are available on Kindle yet. But hopefully they will be soon.